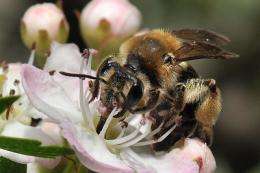 (PhysOrg.com) -- The honeybee has hogged the pollination spotlight for centuries, but native bees are now getting their fair share of buzz: They are two to three times better pollinators than honeybees, are more plentiful than previously thought and not as prone to the headline-catching colony collapse disorder that has decimated honeybee populations, says Cornell entomology professor Bryan Danforth. I've known this for a long time from watching my own veg garden here in the Northeast. Honeybees have decreased over the years to only an occasional sighting, but other pollinators are in abundance: many small bees, bumblebees, wasps, even flies. Crops have not suffered. Plant special treats around the garden to attract them, such as sunflowers, catnip or peppermint, and they will come in quantity.